Today's post is a guest post courtesy of the lovely @MontyC. Thanks, C!!!! So off I went out and bought Rimmel's Volume Flash ScandalEyes Mascara. You can't miss it on the shelf - it's a bright neon orange tube which you can see a mile away and as it was the first one I saw and as I was in a bit of a hurry, I grabbed it without much thought (I did recall reading about it at some point in the past however), brought it back and set to. At €8.95, it's actually very decent mascara. It's a nice fluid, properly black mascara and you can get really good coverage on your lashes quickly (which was a good thing as I was applying it at my desk). It gives a good, clean, defined look, which is what I like in day-time mascara. One thing to take of note of with this mascara - the brush. Or more to the point - the size of said brush. It's absolutely huge. Sneaking around trying to apply it, mirror-free, while ducking under your desk (I would never do this), you could take your eye out with it. The up-side of its size means you can whack it on really quickly, the down-side of it is that you can't really get into those tiny lashes in the inner corner, and it's not really suitable for lower lashes either. 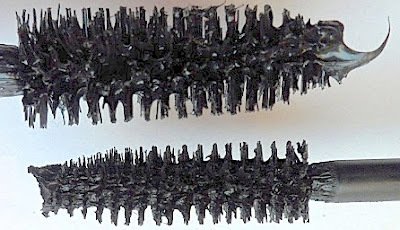 I know some people love a big brush but personally I'm not the biggest fan (I wear glasses and if I'm merrily-and-blur-ily applying it at silly o'clock in the morning, I usually end up poking myself in the eye with an overly-large brush, and the mascara ends up half way round my face - it's not a nice look) but as my first impressions of this mascara are so good, I'm prepared to keep it in my makeup bag and see if we can find a way to get along. As you can see, this is a lovely day-time mascara. No clumpy spidery mess here, thank you nicely. This mascara comes in two shades: black and blacker-than-black. Look here for more info.